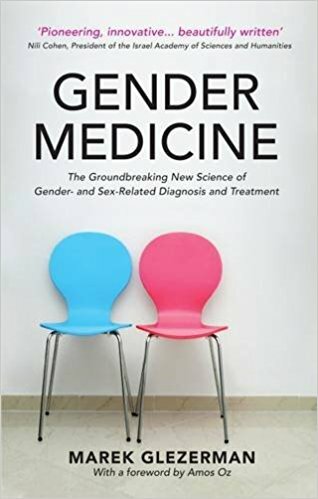 I’ve just finished Gender Medicine by Marek Glezerman. It’s packed with interesting facts about differences between male and female physiologies, from the specific and minor to the more general and challenging. For example, because over millions of years child-raising developed greater motor skills most women have a far wider range of movement in their thumb joint – but they pay the price of being more likely to get arthritis in their thumbs (I’m not suggesting that that’s minor – a friend just visited for whom this is a real problem). Heart disease is generally thought to affect men more. But this is true only to the fourth of fifth decade. Once women reach menopause they lose the protection of oestrogen, and so become just as vulnerable. Heart attacks are less accurately diagnosed in women. Why? Because they manifest themselves differently, and the default understanding of a heart attack is the male type. The overall thrust of the book is that we need to understand the differences between men and women better, and they are often under-researched because research is more often carried out on men. In other words, there is a systemic knowledge bias that needs correction. The chapter on the gut has lots of fascinating stuff. It seems that the gut is increasingly recognised as a kind of second brain, with a good deal of autonomy from the lump of grey matter in our skulls. As we understand the implications of this more, we may get diets that are tailored to our particular profiles, with significant differences between male and female diets. And apparently men might be better off eating about four times a day, to women’s twice (ok by me). I’ll skip over the penultimate chapter – ‘Are Men and Endangered Species?’ (the answer is yes – because we have only one Y chromosome it can’t repair itself) – to get to the most directly Paula-relevant final chapter. It’s on aspects of the doctor-patient relationship. As we all know, a discussion with your doctor involves more than just the exchange of information. There is a social aspect to it, with an element of relationship-building. In general conversations, men are more interested in giving and getting information, whereas women concentrate on strengthening a relationship and finding a shared solution to a problem. Translated into the doctor-patient context, this means that female doctors are more likely to build a partnership with their patient and to encourage patient input. Glezerman is keen to stress that these are generalisations and there is no suggestion that women doctors are overall better than men. But there are areas of competence where there are gender differences that should be recognised.